I am Timmy from Hong Kong,I could say initially I was not a fan of MJ and know little about him, but after his death, I became more and more curious about his life, values and even his thought. 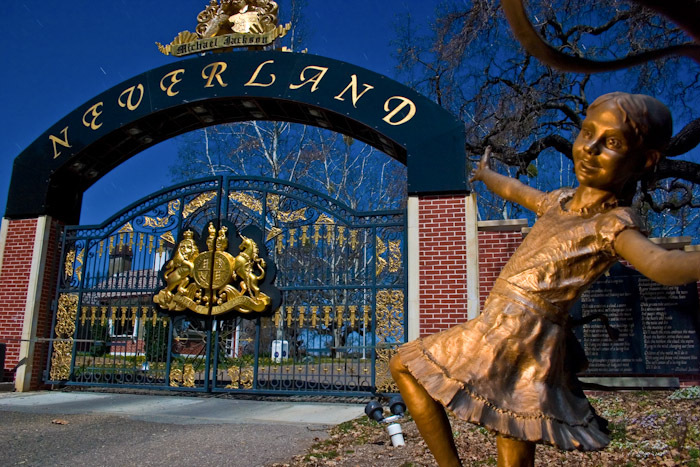 That ‘s why I am searching more infomation about his dreamful land – Neverland. After taking a look of several pictures. I can feel his heart is full of loneliness, while he was making use of this fantasy land to gain more happiness for compensation…… He just tried to build a marvellous, grand playground to experience his supposed childlihood (full of fun, endless happiness) but not abuse and pressure. At the moment, when I came up with this conclusion, I felt so miserable about Michael Jackson’s pain and hurt. Although he is the king of pop that seems no one can reach, he was definitely so lonely during his lifetime. Thus, I think his death may be not that bad from his prospective. Wish him can stay his own ‘Fantasy Land’ forever! It would be interesting to show what this gate looks like now. There is an AP photo of it. The wall, lithographs, bronzes, bench, and seal all seem to be gone only the iron and gold leaves imply it is the same gate. Anyone know where on the property this gate actually sat? These gates are different than the ones that are shown on TV all of the time. Were these gates up the drive a but from the main entrance to the property? That AP photo appears to be of the same gate, without the emblem. Also, supposedly, these exact gates were seen at the Beverly Hills showcase not so long ago. Possibly returned to the property? i completely identify with what timmylee said. i did the same exact thing. got curious, read, and immediately felt MJ’s loneliness and heart, and love. i resonate to it, to him. may he rest in peace. rest in peace michael jackson for ever you sha’ll be remembered.